Summery blend with sun-ripened tomatoes, oregano and garlic. 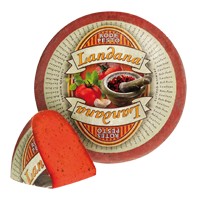 Sun-ripened tomato and a summery red color help Landana RED PESTO stand out from the crowd. What’s more, by adding oregano and a hint of garlic it is a delicious Gouda style cheese that offers various possibilities in cold and warm dishes. Lactose (<0,1g/100g) and gluten free. Contains animal rennet.